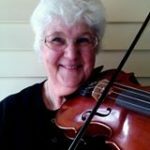 This is an online fiddle lesson for the old time tune "Anna Lee." This is by special request for my friend Keith. 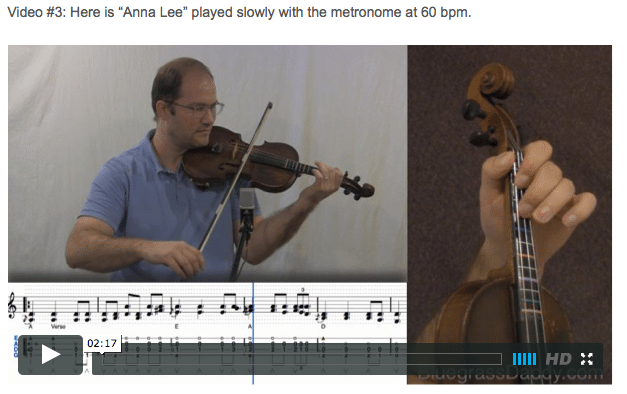 Video #1: Here is a video of me performing the old time fiddle tune "Anna Lee." This is the way I learned to fiddle, before Joel Little talked me into putting it under my chin. I still tuck it into my armpit every now and then, usually to keep it away from my ear (and the microphone) when I sing. "Listen now children, a story I'll tell..."
It seemed a good start: I needed to write an 18th-century death ballad, and I needed to do it fast. The writer Preston Lane and I were about to go into the rehearsals of our first Appalachian play, Brother Wolf. He had added a scene and suggested a lullaby's accompaniment, but I heard something darker. I needed a name for my character, so I began with Rosalie, after my great-grandmother, who had been known for her singing. The name worked well, with the syllables rolling musically. But Rosalie is the name of one of my three daughters, and it seemed a bad idea to drown the kid in a ballad. I cast about for alternatives for a few minutes before landing on the similarly lyrical Anna Lee. I finished the song while sitting in carpool lines at my daughters' schools one afternoon. "...of a woman they called Anna Lee." Six months later, I was in New York for readings with the cast of Brother Wolf. Anna Lee now had a tender role in the play. During a break, the multi-instrumentalist and Bob Dylan sideman Larry Campbell found me and the show's fiddler, Riley Baugus, tuning our instruments in the stairwell. "Who wrote the Anna Lee song?" he asked enthusiastically. "I am making a record with Levon Helm. Anna Lee is his old friend from Arkansas—Anna Lee of 'The Weight.' It would be cool to bring her full circle on this record. Can I take the song to Levon?" And that is how Miss Anna Lee introduced me to Levon Helm. The introduction induced fortunate incidents—trips to Levon's famous Midnight Ramble in Woodstock; a Grammy for Levon's Anna Lee-inclusive album Dirt Farmer; a memorable night of Levon and his friends in Nashville, dubbed "The Ramble at the Ryman." Every time I saw Levon he asked about my children, teasing my husband to get me back home so I could keep writing songs. Before the Ramble at the Ryman concert, I got to meet the real Anna Lee Amsden in Nashville; she was none too thrilled about being drown in a song and didn't mind telling me so. Still, that evening, I sat in the pews of the Ryman with my playwriting partner, Preston Lane. We listened, spellbound as Levon sang with an angel band—his daughter, Amy Helm, and Larry's wife, Teresa Williams, singing harmony. Larry played the fiddle. They sang my words like a prayer, with Levon's voice pulling every ounce of emotion from each note, each phrase. As the sparrow returns to her nest." There was I time when I sang to my children constantly; I was their singer, free to sing them to sleep or into calm, whenever they needed it. As I was writing, I foolishly wondered if —when they are old and I am gone, as Levon is now—they would remember the voice that sang their lullabies. As it turns out, there are some voices we can never forget, voices that work their way into our hearts, brains and bones. And so I remember Levon, singing. Anna Lee has indeed come full circle. Posted in Intermediate, OldTime	Tagged with: "Anna Lee" "Larry Campbell" "Levon Helms" "Laurelyn Dossett" "old time fiddle lesson" "bluegrass fiddle lesson" "Bluegrass Daddy" "John Cockman" "John's Fiddle Lessons"
This topic contains 19 replies, has 6 voices, and was last updated by Rock 3 years ago. 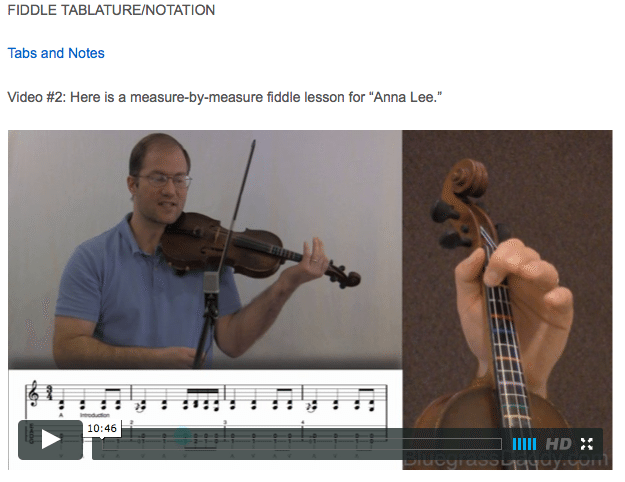 This is an online fiddle lesson for “Anna Lee.” This is by special request for my friend Keith. Fine accompaniement, John! Such a sad song! Also, you sound better than Levon Helms. I’m happy to report that I can hold my fiddle like you do on this song…only problem is that I can’t play it that way! I’m glad you posted this to show what a fiddle can do as the sole back up for a ballad. Thanks Justine! Unfortunately Levon had been struggling for around ten years with throat cancer at this point. This was recorded in 2008, a year after his comeback, when he estimated that his voice was at 80%. Cancer finally took his life in 2012. He had a pretty good voice when he sang and played drums with “The Band,” but I believe that years of out-singing the drums really damaged his vocal chords. Thanks for explaining that, John! I should be appreciating him for carrying on when he had a serious llness! I know, Rock! Love that fiddle harmony. I think that some old time fiddlers were one man bands! I am actually working on a 15-week curriculum that will take fiddlers from beginner to awesome. Actually, it will probably be a two-semester, 30-week course. It will include backup and improv, which a lot of people want to see. As someone once said, “I have big plans for the walnut grove.” I just wish I had more time! Beautiful voice. Beautiful fiddling. Beautiful but sad song. I just wonder though what my friend Yehudi would say about your bow hold. To me, how you held your fiddle is the proper way of holding a fiddle, as we have discussed a number of times before. 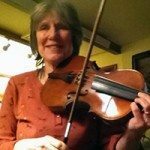 I find it easier to hold and play my fiddle like that as opposed to having it ridiculously plopped on my shoulder and stuck up in the air like the rear end of an Ostrich! I’m allergic to feathers, by the way! There are a lot of old ballads that sound fantastic with only a fiddle backup. This one makes me cry every time . But I cant do both at same time. Thanks Gu, it makes me cry too, though Rock would say that’s easily done. I love a heart-wrenching mountain ballad. Wha1 Wha! I love that sad sad song! I hesitate to play and listen to Anna Lee because it races through my mind and I can’t get to sleep. Not to mention the crying, I have to get up and change my pillow case often. 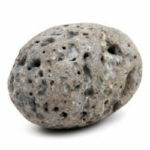 Rock, that is why I use a plastic, zippered pillow case. I have ruined too many pillows listening to sad songs at night. Anna Lee is so haunting. I really want to do more like this. I may be an English lad, but I still cry when I sing “Flow Gently Sweet Afton.” Nothing wrings me out like a late night singing Irish songs. This one is relatively new, but it still fits the mold. So beautiful! Wow! I just realized who these guys are! I used to listen to them all the time. Just didn’t put it together. Just got home from a 3 day choir performance . Who eee what a week end! Great song, Gu!!!!!!!!!!!!!!!!!!!!! I listened to it earlier today. Just love that song! !